critters | Run Todd Run! Our long run this weekend took us to our hometown, which is where we like to do our long runs. Our families are there, and we still have a place there. It is mostly rural, with lots of farms, forests, and fields. Most importantly for us runners, it has a lot of long, straight, low-traffic roads. My mid-week training runs are usually from subdivision to subdivision, dodging cars on the road between them. I enjoy these runs, but they do not compare to the beauty of our long runs in the country. The scenery is gorgeous. The drivers in the cars that do pass, do so with a wave and a smile. On this particular run, we saw cows, horses, a muskrat, Canadian geese, sandhill cranes, and two dead skunks (luckily, they had been there a while). The cows seemed every bit as interested in us as we were in them as they came to the fence to check us out. The horses just looked at us like we were crazy. We passed rustic old barns and gleaming new ones, and were able to take in the fresh country air. Just like the roadtrip games in the car such as sign alphabet, and I spy, rural running presents the opportunity to play games to pass the time while on a long run: What’s that animal? What’s that smell? What’s that sound? About those skunks. We met the first one about 1 mile in, and the second one was at about mile 8. They got me thinking, what do you do if meet a live one or fresh one? Honestly, I had no idea what I would do. You can’t exactly go to a nearby house and ask for help. First, there aren’t too many close by. 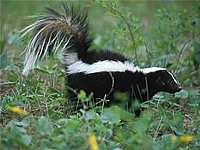 Second, who wants someone stinking like skunk showing up at their house? My only conclusion was that if I had such an encounter, I would have to turn around or tough out the rest of the run. It would certainly be a PR for whatever distance that would entail. I will just have to hope I don’t meet the critter halfway through the run. But just in case, I now have a de-skunking recipe (albeit one designed for dogs – but if you are in a situation where you need it, who really cares?). I share it below for anyone interested. I bet the ladies running the RunDisney Princess 1/2 Marathon didn’t have to worry about that this weekend. Still, the scenery along our run was every bit as gorgeous as the scenery at Walt Disney World, and I felt even more blessed to be there. Don’t leave it on too long (peroxide can bleach). Rinse thoroughly. Next, wash with shampoo and rinse thoroughly. You can rid your clothes of the smell by using regular laundry detergent mixed with a half-cup of baking soda. This entry was posted in Running, Rural Running and tagged critters, rundisney, Running on February 25, 2013 by jtspurge.